Oli Hawkins believes Pompey can be well on the way to achieving their promotion target as early as the new year. The striker is confident the Blues will be on the way to the Championship if they maintain their place at the top of the table by the end of December. Pompey enter a crucial period of the season four points clear at the summit of League One ahead of a hectic run of nine games in 36 days, which starts with Walsall’s visit to Fratton Park tonight. In that busy schedule, Kenny Jackett’s side face fellow promotion challengers Barnsley and Sunderland on successive weekends just before Christmas. And frontman Hawkins says Pompey must continue to build on the great position they find themselves in. But the former Dagenham & Redbridge striker knows how quickly all of the Blues’ good work could come undone, should their form begin to slip next month. Hawkins said: ‘I think December is going to be our biggest test yet. ‘We’ve got a lot of hard games coming up. ‘If we can come out of December being top of the league, it’s only one way the team know it can go and that is promotion. ‘We’re going to have a tough December but we’re going to try as hard as we can to get the points. ‘We need to battle hard and get prepared for these games. ‘There’s a lot of games with FA Cup and Checkatrade Trophy matches in there as well. 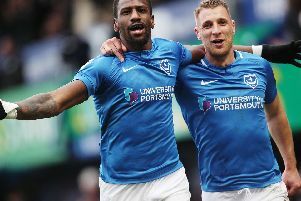 Pompey’s 2-1 triumph at Scunthorpe on Saturday was the first time they had been in league action since the victory over Bradford at Valley Parade on November 3. The Blues did have FA Cup and Checkatrade Trophy matches. But they enjoyed an 11-day break after beating Tottenham Hotspur under-21s and the victory over the Iron. Hawkins feels time without a fixture helped the players. He added: ‘There are a lot of games to come and I think the break did us good. ‘We’re now prepared for Saturday and Tuesday games until the end of December. ‘It was beneficial because it gave us some time off. ‘We won after the break we had. ‘Now we want to do the same against Walsall. ‘All the boys had some time off in that period as well.